Is there any trash you can’t accept? Prohibited materials or inappropriate projects include, but are not limited to: old tires, discarded batteries, paint, and disposal of household and industrial chemicals and cleaners. What are the regulations for disposing of appliances, refrigerators, air-conditioners, etc? Some appliances containing Freon and other CFCs may need special handling. We can answer your questions and help you dispose of unwanted appliances and other garbage or debris in a legal and environmentally safe fashion. Driveway Dumpsters is fully insured, licensed by the Department of Environmental Protection, and by Allegheny and Westmoreland County Health Departments. How long has Driveway Dumpsters been in business? 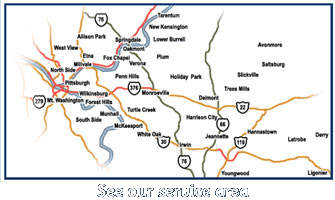 Driveway Dumpsters has served Westmoreland County and the Pittsburgh region for over a decade. We are a locally owned company serving you, our neighbors. Your dumpsters are small, what are appropriate jobs? Disposal of excess garbage, rubbish, waste, old appliances, and unwanted furniture. Removal of waste and debris from kitchen and bathroom remodeling. Hauling away debris from do-it-yourself shingle roof jobs. Yard waste, including disposal of brush, trees, stumps, leaves, and grass. House clean outs: removing debris and trash for real estate agents and landlords, when tenants leave a mess. Removing unwanted garbage from estates for sale. Cleanup of debris from small construction, demolition, and remodeling projects. Tearing down old sheds, fencing, and playgrounds, etc. Driveway Dumpsters accepts personal checks, business checks, and cash. At the current time, Driveway Dumpsters does not accept credit cards. 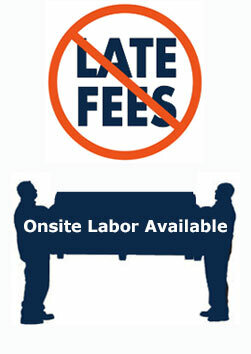 Give us a call today at 412-760-1468, or use the FREE QUOTE form on this page.